To say that I was remiss in not taking a notebook and pencil along is an understatement. The artist Louis de Niverville came to visit the RMG a couple of weeks ago with friends. Jason, our Preparator, and I had taken some time in the morning to open the vault racks and pull out solander boxes that housed some of his works on paper in order to make viewing the fourteen works from our collection as easy as possible. Louis was absolutely charming, examining each work like it was a long lost relative—and his memory was remarkable. We stood in front of Mother and Child, a painting of what I’d always thought of as an imposing woman holding a crying baby. I knew the child was a two-month old Louis and knew that he had painted the work from a 1933 photograph. I’d always assumed that the woman was quite stern as she sat so monumentally within the picture frame. Not at all. In fact, Louis’s mother was a gentle woman with many children who constantly worked to keep the family organized. Louis’ reminiscences made me re-think a painting I’ve known for many years. 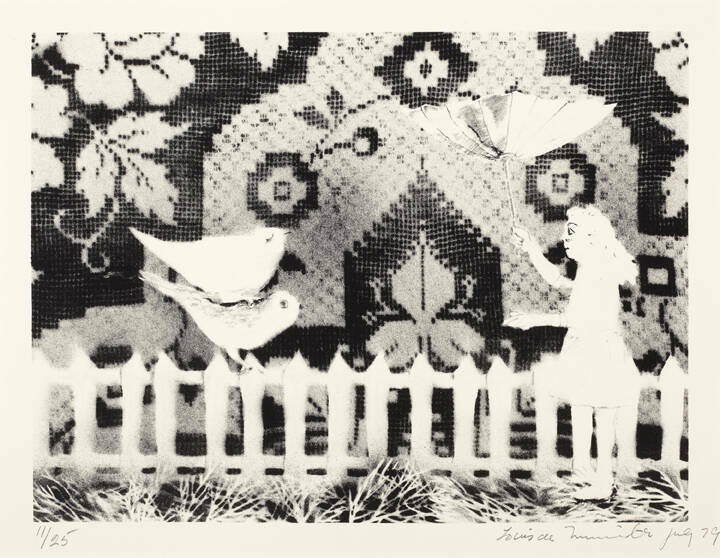 Louis recalled the technique he used for his multi-media works and let us know that the beautiful and delicate Untitled print from 1979 was the first print he’d ever produced and how he used a spray gun to develop his technique. There were other notes to add tohis files: Still Life with Abundance #2 was one of four large collage works representing the seasons, and Mother and Child from 1970 was the last oil on canvas painting that he completed; he also gave us more detailed comments on the medium he used forhis collage works. All of this information is not only useful for RMG staff, but also for researchers who come to access our collection. While Louis was incredibly grateful for the tour of his work, in reality, the pleasure was all ours. What a privilege to a have such a respected Canadian artist tour us through our collection of his work!